There are many Ponzi scheme website working on the internet. We all know that Ponzi scheme is an illegal scheme. But do you know that many companies and websites are working on another illegal scheme known as Pyramid Scheme? If you are thinking questions like, what is a pyramid scheme? What is pyramid scheme definition? Does pyramid scheme work? You have arrived at the right article. We are going to discuss Pyramid Scheme in detail. What is Pyramid scheme about? How does Pyramid scheme work? Pyramid scheme basically, it is the scheme which somehow looks similar to MLM i.e. “Multi-Level Marketing” but they actually work like a Ponzi scheme. In Pyramid scheme generally, members work for the site as an affiliate to make new affiliate. In a Pyramid scheme, a company always lures people with high ROI (Return on Investment). But as we have mentioned the pyramid scheme work like “Ponzi scheme” which pays to its old members from the money deposited by the new members. Therefore, a pyramid scheme is declared an illegal scheme and does not sustain for long. The problem with this model is that under pyramid scheme company provides the commission for making new affiliate is from the money invested in the new product. It means being an affiliate member you are not selling any real product for which you are receiving a commission. Another problem with the pyramid scheme is that it totally survives on the new wave of affiliate below every member. Since soon the time will come when the membership will become saturate and people will not receive any commission because nothing is working below in their chain. People get confused by the MLM with Pyramid scheme and pyramid scheme with a ponzi scheme. In later, this article we are going to distinguish between the MLM, Pyramid, and Ponzi scheme. So fasten your seat belt we are going to take off. What is the difference between Pyramid Scheme and MLM? In laymen language, if we have to distinguish between the Pyramid and MLM is then in MLM, people sell the real product or services and earn commission by selling the commodity. But in the Pyramid scheme, the affiliate makes new affiliate below him and does not sell any product or services. They just bring people under them to invest in a company. Therefore, the commission member earn will burden on the money invested by the new members. It is very difficult to point out the difference between the Pyramid scheme and the MLM “Multi-Level Marketing” due to many similarities between them. Many people get confused between them. But not anymore when you understand the working of both schemes. Legit MLM businesses are more focused to sell the products. They recruit new members to sell their product and pay them from the profit is earned by selling a product. This is the way most of the marketing strategy works. On the other hand in Pyramid scheme, the member may or may not sell any product but their main focus is always on the making new members and not selling a product. 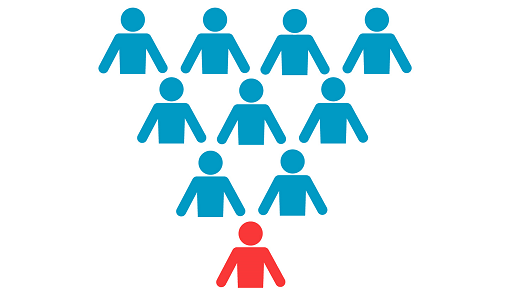 MLM companies sell their product to real people but in a pyramid scheme, they do not depend on the real people but they are more focused to get the new members or more specifically the new investors. The line between the MLM and the Pyramid scheme has been blurred by some companies which makes it difficult to identify which is MLM and which is Pyramid scheme. The point to remember is that if you are making good money by making new members or selling something to members and not to the consumer then it is definitely a pyramid scheme and sooner or later it will going to face some legal issues due to its illegal nature. What is the difference between Ponzi and pyramid scheme? Now, let’s talk about the MLM and the Pyramid scheme. In the simplest manner, “Ponzi scheme” is the scheme in which company pays to its members from the money invested by the new members. In this way, the company will be going to accumulate a huge debt over them. In the absence of any source of revenue other than receiving an investment, the company is going to become bankrupt if they pay as per their claim but they generally run away with people and nobody can catch them it is because of lack of information about them. In Pyramid scheme as we have mentioned it works on the new wave of new members only. The company pays commission for making new member below the members and they are not selling any product which means the company does not have any profit from which they share the money but they will pay from the money invested by the new members. Both the Pyramid and Ponzi schemes are the illegal business model. If we talk about who is more dangerous than Ponzi scheme tops the chart. This is because in Ponzi scheme people in actual believe that they are investing their money in some business plan or in some business project. The companies working on Ponzi scheme make people believe that they are in real earning a very great profit by investing people money in their project but in reality, they are not investing any money anywhere. People do not understand the process and get partially blind by the high ROI offered by the company. But in Pyramid scheme, the members at least know that they are going to earn by making new member below them. Their earning is totally depending on their work and the no. of affiliates they make. However, they do not understand that the earning or profit they are receiving is from the money invested by the people and sooner or later they are going to lose their money which they think they will earn by making a chain behind them. Somehow, it is beneficial for the person above the chain and very hard to earn money for the person who is below in chain. The volatile nature of the company, which is sooner or later going to be shutdown make the person below the chain more vulnerable. The Ponzi scheme remains for a long time as compared to the Pyramid scheme it is because pyramid scheme need rapid growth for its sustenance but this is not required by the Ponzi scheme. It is very difficult even for the authorities to understand or point or spot the Ponzi scheme. For instance, one of the biggest scam made by human in recent past is the man named Bernie Madoff. He is convicted of the scam of $65 billion dollars using the Ponzi scheme. The time period between which he scammed people is of 30 years. For 30 years people were unable to detect that they are investing in a Ponzi scheme. It was due to the global financial crisis of 2008 which revealed this Ponzi scheme. Due to the downturn, Madoff was not able to pay his investors as most of the members are trying to cash out money from the market. His scheme collapsed drastically and revealed the true nature of his work i.e. Ponzi scheme. At present, he is sentenced to 150 years of imprisonment. Now you will understand completely that to detect such scams is very hard to even for the authorities. So beware and always try to think wisely before investing in any lucrative plans. There is some revenue sharing sites available in the market that shares their revenue with their members. But the doubt is the revenue sharing sites are legal or not is still there. The authorities did not give any clean chit to the revenue sites. There are many companies present out in the market that fools people by confusing them and by making them that they can earn a very good profit in short time. This is not possible. There are much has been written already in above paragraphs about the Pyramid scheme. Be wise and beware of such sites and also help people in your social circle to know about such sites. Share your knowledge with your peers so that they will not get harmed by such companies in future or in present.